Chichen Itza is the most important archaeological site in the Yucatan and voted one of the new "Seven Wonders of the World". Chichen Itza Express Tour includes your van and driver for the day, entrance into the ruins, tolls, parking, taxes & insurance. It does not include guide in the ruins or lunch. 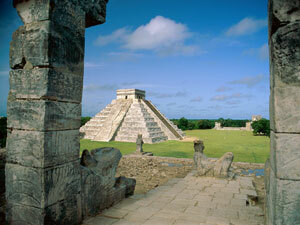 You can either make this a quick tour or you can spend the whole day in Chichen Itza. Your driver can suggest places for you to stop for lunch. DOES NOT include guide in Chichen-Itza (Optional, 800 pesos ~ approx $75 USD for a 90 minute guided tour) or a tip to the driver if warranted. Itinerary: It is a 2 and a half hour drive from Cancun. I suggest a 7 AM - 8 AM departure. Stay there for 2.5 - 3 hrs. Walk in the town, buy a few gifts, have lunch at one of the restaurants in Chichen-Itza, head back to Cancun early or go to Valladolid to see a small town. It is a great place to take a few photos in the park. It is up to you! Pack for this tour: Sunblock, sunglasses, hat, bottle of water, camera.